Succession planning can sometimes seem overwhelming. With so many moving parts, it can be difficult to know if you’re on the right track. Below, we outline 10 common succession planning mistakes that organizations make. Building in plans and checks to avoid these pitfalls will help to ensure the success of your process. Given the time and resources required for effective succession planning, many organizations tend to focus their efforts solely on executive level positions. This approach can lead to detrimental gaps in important non C-suite roles, particularly when individuals in lynchpin roles suddenly leave the company. Don’t forget to consider including key positions in administration or IT when developing your succession plan. Adopting an existing competency framework on which to evaluate succession candidates can save organizations a great deal of time. However, any off-the-shelf framework is unlikely to adequately capture the complexity and uniqueness of your organization. Don’t let the convenience of ready-to-use competency models lead you to overlook characteristics that are important to your organization. When identifying which competencies are needed for a given role, there can be a tendency to describe those qualities you’d like to see of the individual in the focal role, rather than the actual requirements. Remember to focus on what is essential to success in that position. An important part of succession planning is anticipating future needs. Part of this means taking time to reflect on the future of the focal role. Consider how changes in technology, your organization, or the broader industry might impact the responsibilities associated with the position.Be sure the successors you identify are being developed for a role that will still be around when they are ready, and that they are being trained in skills that will be essential in the future. Succession planning is an important strategic process and there can sometimes be the feeling amongst leadership that the plan should not be communicated throughout the organization. However, a lack of transparency might lead some high-potential employees to leave the organization if they do not perceive the availability of strong advancement opportunities. Communicating to employees that these opportunities exist is likely to have a positive impact on their motivation to pursue developmental goals, and to remain with the organization long-term. When asked about their succession plan, some companies feel they are on the right path because they have identified a successor for key roles. However, this can be a problem if your one succession candidate decides to leave the organization or accept a position in a different department. Taking a more narrow focus can also make it difficult to fill the inevitable vacancy left in middle-level leadership roles when an employee steps up into a senior leadership role. Having a talented pool of candidates gives you options when it comes to filling a focal role, and ensures you’ve developed sufficient talent to fill vacancies as they arise. A common mistake made in succession planning is the assumption that high performing individuals at one level will continue to perform well in a higher-level position. Continued success is not a guarantee, which is why it is so important that you carefully identify the competencies needed for success in the focal role. Evaluate all succession candidates against this criteria, not their past performance. Succession planning should always be a company-wide initiative. Depending on your organization’s structure, it might make sense for your HR department to spearhead the process, but placing all the responsibility on HR is typically not effective. The most common reason that succession planning fails is a lack of management support. In order to achieve success, all parties need to be held accountable. Some organization go through the work of developing thorough succession plans but then become stalled in the implementation phase. You should never go more than 6 months without reviewing your succession plan. As individuals undergo professional development, their readiness to move into new roles should be re-evaluated. Also, remember that succession planning is a dynamic process – your plan may need to be updated if your organization faces unexpected challenges. 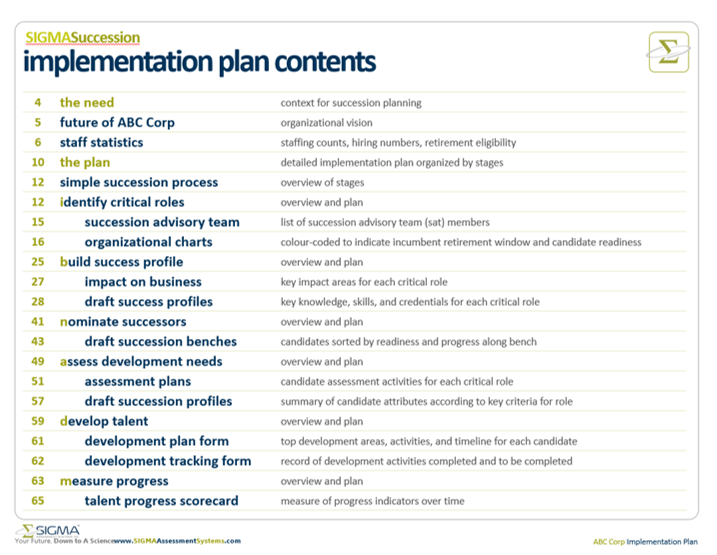 As outlined in SIGMA’s six-step succession planning process there are several components that go into the creation and implementation of a succession plan. Carefully documenting this process can sometimes seem low priority in light of all the other things that need to get done. However, having this information is important for two key reasons. First, you will be better able to communicate the success of your program if you can clearly state what was done and the impact it had on key indicators. This is essential when making funding requests to extend succession planning to other areas within the organization. Second, having a carefully documented succession process is vital if your organization ever finds itself in a situation where it must defend selection decisions. You may not know the true value of having this information until you need it. At SIGMA, we have a variety or resources available to help with succession planning. Start by reviewing our Sample Succession Planning Process for strategies on how to avoid each of the pitfalls we’ve discussed here. Contact us to learn how we deliver a full year Succession Planfor each member of your leadership team in just two half-day workshops.